Oil-Electric: CPR's First "Subdivision" Dieselized! Canadian Pacific Railway 7068, Esquimalt & Nanaimo Subsidiary, Victoria B.C., July 16, 1960. Our family made frequent visits from Seattle to Victoria, to visit Granny and Grandpa. Every summer my Mom would shuttle my Sister and I down to the CPR Lenore Street Terminal, Pier 64 in Seattle and load us on board either the Princess Patricia or the Princess Marguerite for the run up the Puget Sound, past Port Townsend (where I ended up in retirement!) through Admiralty Inlet, and across the Strait of Juan de Fuca to Victoria, just over 100 miles. You’ll be pleased to learn she’s still alive! We’d been back from Prince Rupert and had taken the family bus up to Victoria to visit with the Grandparents and do some incidental train chasing. My Dad and I found diesel-hydraulic CPR 15 and this handsome Baldwin puttering around, doing this and that. 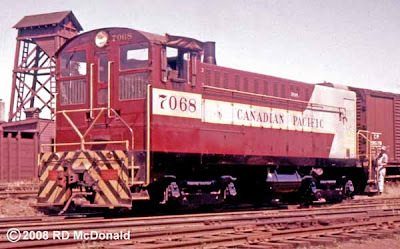 There were only 11 of these units built for Canadian use, Canadian Pacific taking all eleven units, number 7065 through 7077. They were fitted with multiple unit controls and did the bulk of mainline work up and over the Malahat to end-of-track at Courtney. It is a little known fact, that with the arrival of the modified Baldwin’s in 1949, the E&N became the first "division" of the Canadian Pacific Railway to be completely dieselized! The DS4-4-1000 with the 606SC engine is sometimes referred to as an S10 model. If it’s been a while since you’ve heard the head knocking sound of this power pack, there is a sound file down the page, of an 1,000 horsepower motor, in it’s supercharged configuration. Railroad Stuff: Canadian Pacific Railway 7068, Baldwin DS4-4-100SC, 1,000hhp, road class DS-10-g, built in 1948, serial number 73945-2522. Built at the Eddystone Plant of the Baldwin Locomotive Works in Pennsylvania. In order to reduce customs duty, the locomotive's construction was sub-contracted through the Canadian Locomotive Works at Kingston, Ontario. 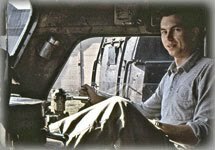 Retired in 1975. Miss your posts. Hope all is well. Thanks for your concern, spd45. Five weeks in hospital. More to follow in new post! CP also took delivery of 13 Baldwin DRS4410 locomotives. They were used all over the E&N, not just on the Victoria-Courtenay mainline. The Port Alberni, Lake Cowichan and Great Central Lake branches all saw the baldwin diesels.